1-Day Acuvue define lenses are also an enhancement lenses, commonly known as Circle lenses. They are design to enhance the appearance of your eye, making them looks bigger and brighter. This effect is achieved by designing a dark limbal ring on the lens. 1-Day Acuvue Define Circle Lenses are available both with prescription from -0.25 Dto -0.90 D and in Plano lens (0.00 no spherical power). In additional to this characteristics they are also have UV Blocking that enable the protection of the inner position of your eye against harmful ultra violet radiation from the sun. 1-Day Avuvue define is design for daily wear thus you can simply open a new pair everyday to enjoy a fresh, clean lens daily without the hassle of cleaning. 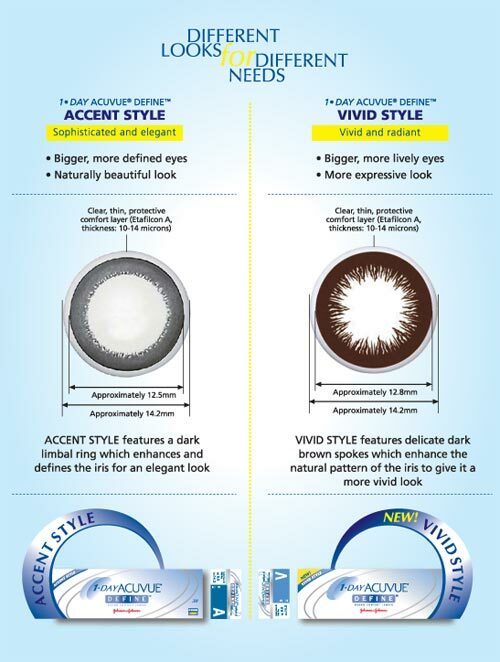 1-Day Acuvue Define - Vivid Style has a brown ring with delicate brown spokes that enhance the natural pattern of the iris. 1-Day Acuvue Define - Accent Style has a dark limbal ring that enhances the iris for a more elegant look. 1-Day Acuvue define – natural Shine style has a Natural dark grey limbal ring combined with a glittering gold shine enable your eyes to look bigger and more glamorous. People who are looking for an enhanced look of their eyes plus who are looking for a convenient, no-maintenance way to wear contact lenses can find that 1-day Acuvue define a splendid choice. With 1-Day Acuvue Define Contacts you will get bigger, brighter and more beautiful eyes in a natural way and since it is design for daily use , you don't have to worry about cleaning solutions, lens care or lens cases . The lenses have UV Blocking technology to help protect your cornea and the interior part of the eye. Hope you can enjoy your 1-day Acuvue Define Today!